Hi everyone! I’m finally armed with unlimited access to my computer, photos, and the internet! The past month, I’ve been in 5 different time zones, to 7 countries, and on 9 flights. But before I tell you more about what I ate and saw, I’ll first give you the full report on the Virgin Atlantic flight I took from NYC to London (total flight time 6 hours). Judging from the box and the cheerful greeting, I was hopeful that there was something edible in the box. 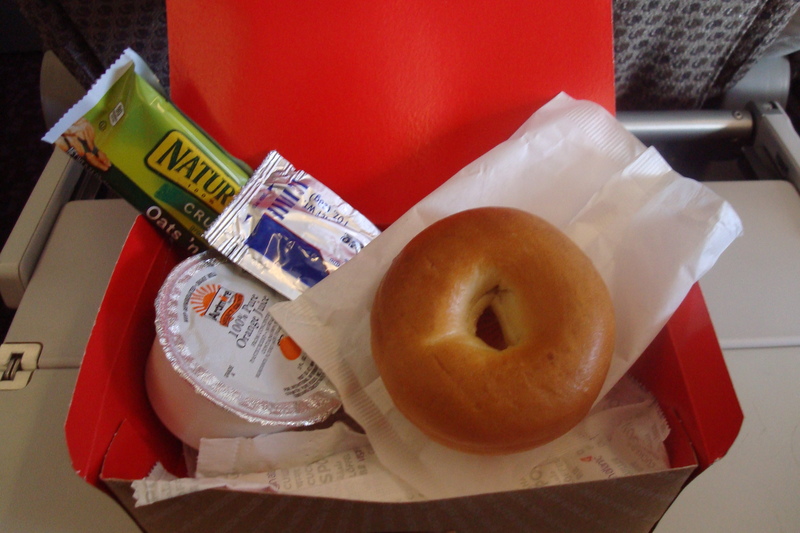 Orange juice, a granola bar, cream cheese, and a plain bagel, which by the way tasted like aluminum. I tried my best to eat as much of the bagel as possible but gave up and ate the granola bar instead. By the time the food trolly made its way to my seat, the only option that was left was the chicken korma. I asked the flight attendant if there were cashews in the korma. Without missing a beat, she said no. But said that she couldn’t promise me anything because there might be traces of nuts. I said traces were fine and took the meal. I tried to flag the flight attendant but she was too deeply immersed in her duties so I pushed the call button and waited. 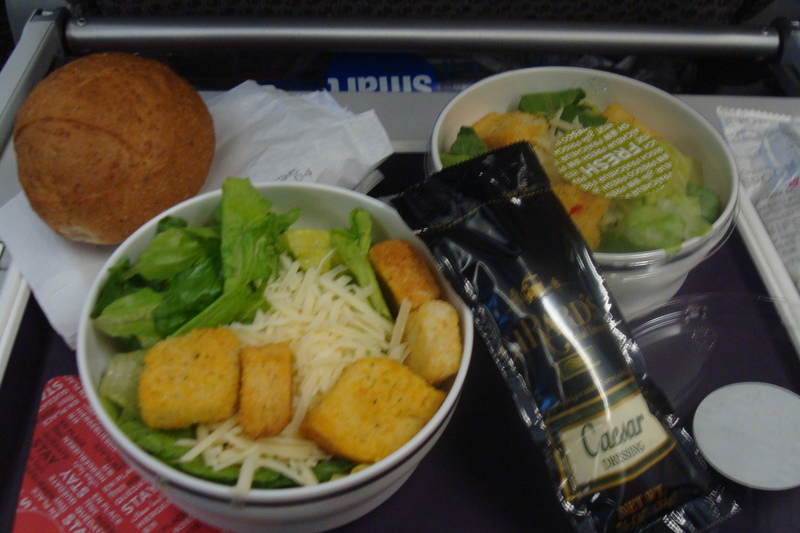 After 20 mins, another flight attendant emerged and told me no other meal option was left so I asked for another salad. When the trolly came by the 4th time with chocolate pudding, I declined because I didn’t want to engage in further conversations with the flight attendant. I just wanted the meal service to end! But I must give them credit as a total of two and a half hours of meal service on a six hour flight did make the flight seem shorter. My experience reminded me of the famous complaint letter about the meal service on Virgin Atlantic. But now I’m expected not to really check my school e-mail (I still check it everyday if I can!) or communicate with anyone until the start of the semester without explanation. So, I was just going to disappear for a couple of months, but then I figured it wouldn’t be fair for all of you! Plus, I don’t want to lose you, devoted readers! Since school is out, I’m spending a month in Europe and the rest of the summer in Korea. I’ll try my best to update you on the delicious and fun things I’m doing but it may be sporadic as I won’t really have access to the internet and my photos for the next month. Virgin Atlantic’s in-flight meal and service! 1. The longest meal service of my life on any given airline to date! It just wouldn’t end! You would think that they would want to get it done so that they could do other things! 2. I was almost poisoned by one of them but she cleverly said “I can’t guarantee anything” about the allergen information before blatantly lying to me. Good thing I check all food labels! 3. And there was a butter fiasco. Intrigued? Hope so! I’ll be back with the full story and photos in a month! Would you want a professional chef cooking up a meal that fits your exact specifications on your next flight? Etihad Airways (link to Shivani Vora’s nyt piece) has launched a new way to please its first class passengers. According to the nyt report, it has recruited 100 chefs, including ones from the Fat Duck in the UK and Fenix restaurant in Melbourne. Long-haul flights from Abu Dhabi to Paris, Geneva, NYC, and Sydney have flying chefs that can make steaks, souffles, and salads to order. Etihad Airways is not the first airline to come up with this concept. In 2006, Asiana Airlines started an in-flight sushi service. I have been told by chefs who served sushi on board that the fresh fish was specially treated to meet international health regulations. Sushi knives were not allowed on board so all components had to be prepared for chefs to assemble the sushi in-flight. Another airline that has a chef on board is Turkish Air. Check out their “Flying Chef” commercial featuring Kobe Bryant! Let’s pretend that this service is available in all class cabins. Who would you rather have cooking your next in-flight meal? A Flying Chef or Kobe Bryant? 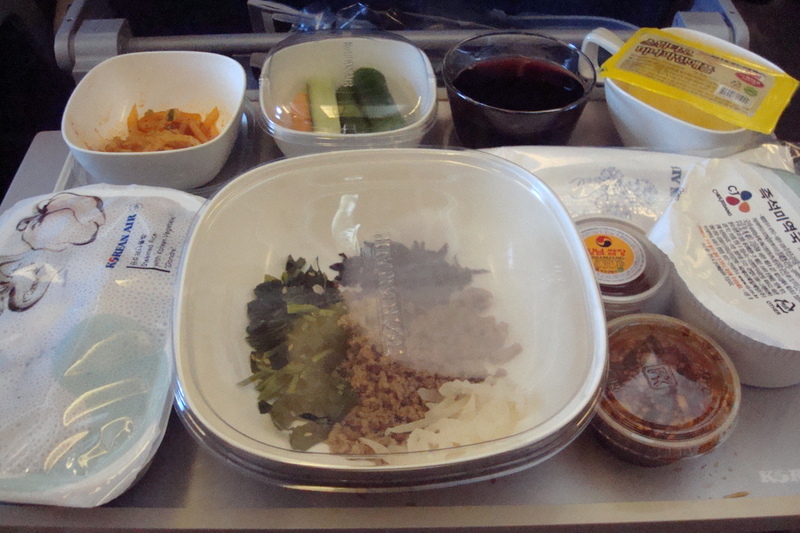 I’m happy to report that Korean Air has introduced a new Korean in-flight meal option! 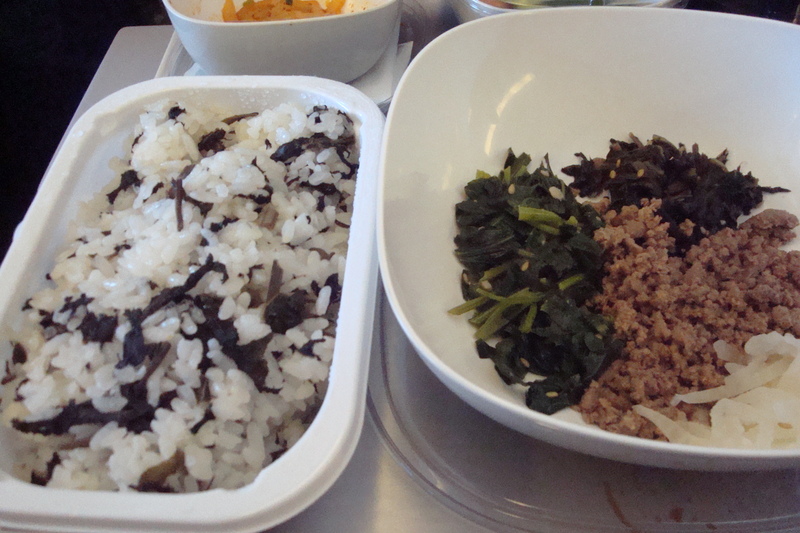 Steamed rice with gondre (a wild vegetable that grows in high altitude regions in the eastern coast of Korea)! The spread looks similar to their signature bibimbap service. 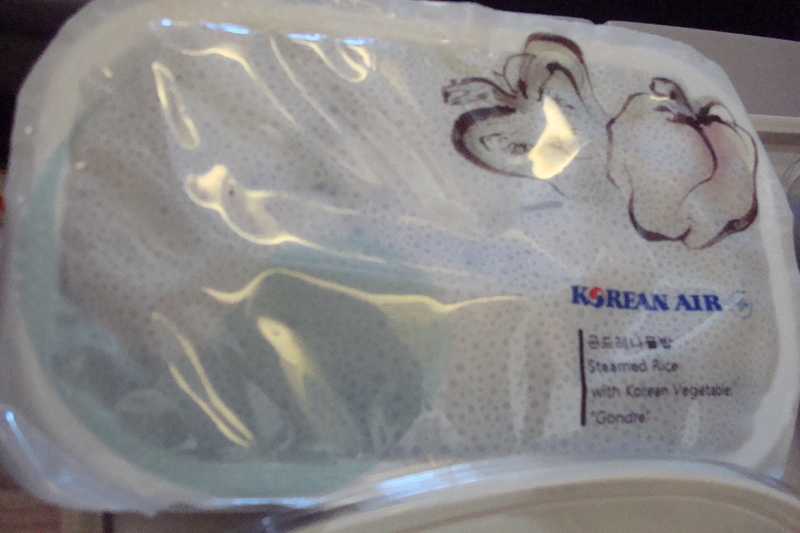 Introducing Korean Air’s new packaging! Do you like it? The gondre rice is mixed with other namul (steamed and seasoned vegetables) and ground beef and seasoned with spicy soy sauce. I was secretly getting pretty bored with bibimbap so I was thrilled to see that they were working on variations! The flight attendant informed me that they had just launched this dish two months ago. I have had gondre rice before and I like its distinct earthy flavor. I really enjoyed the three different types of namul that were in the big bowl as well and thought it was refreshing to have seasoned soy sauce rather than gochujang. Looking around, I was surprised to see that other passengers (mostly young college students returning for the spring term) were eating the Western style beef stew with boiled potatoes. Call me old fashioned but I got to have rice when I’m flying! One thing I like about air travel is that you get to spend time (hopefully, not too long) at airports. It’s a great place to people watch! 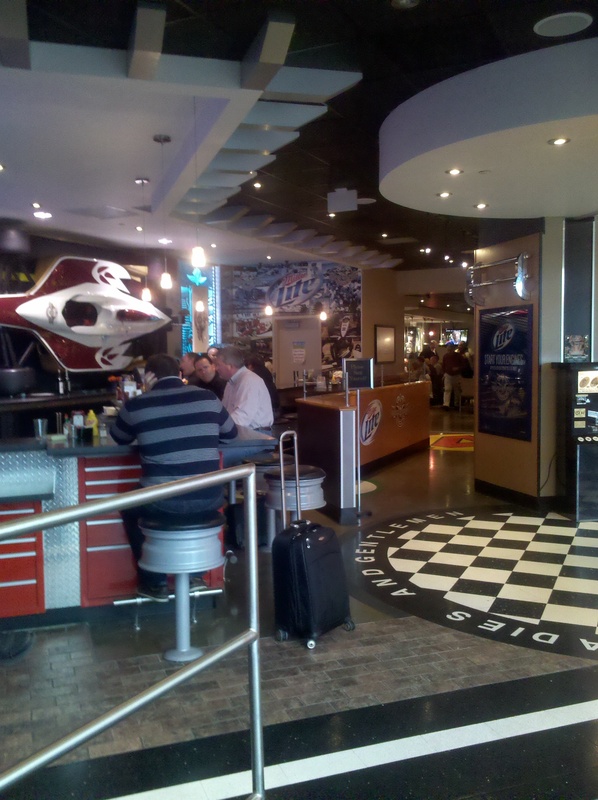 While I’m waiting for a flight, I usually eat or walk around to check out the stores and restaurants. Since I did the former two weeks ago, I decided to browse the different dining options at the Indy airport. The first thing that caught my eye was the Indy 500 Grill! I had seen this restaurant before but it didn’t mean that much to me. I just thought it had something to do with NASCAR. But everything changed when I recently visited the Indy motor speedway for an assignment for my heritage tourism class. I gained a deep appreciation for the speedway because it is the world’s largest speedway still in operation! A true American icon! 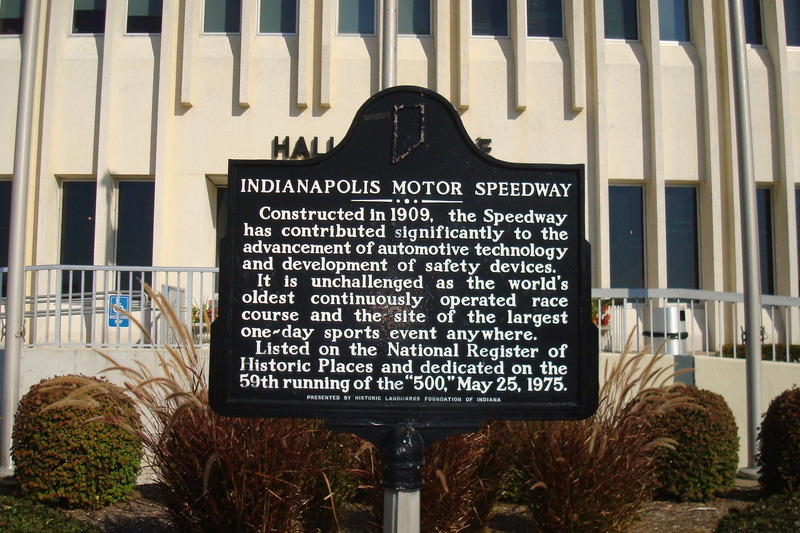 The speedway also drove a lot of technological innovation in the car industry. Designated as a historic site in 1975. So when I saw the grill, I got so excited! Would they be serving food reflective of Hoosier heritage? Do you see the Bud Light logo in the back and the race car on the wall? I glanced at the menu but nothing really screamed Indy 500. I don’t know what I was expecting. 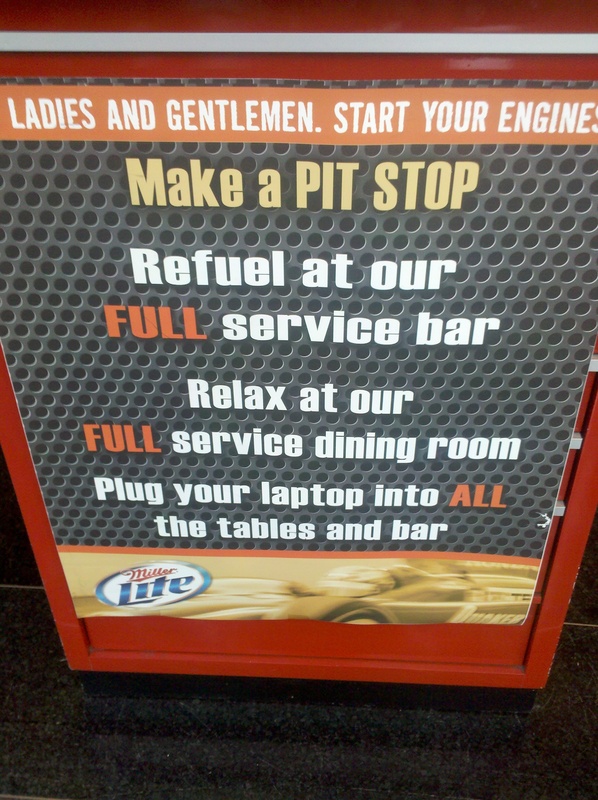 But maybe dishes named: “Ear plugs necessary,” and “Rev your engine” may have been catchy…or not. WOW! Now I want to know how much food was wasted! I’m obsessed with menus. I like looking at the format, ingredients, descriptors, and categories. 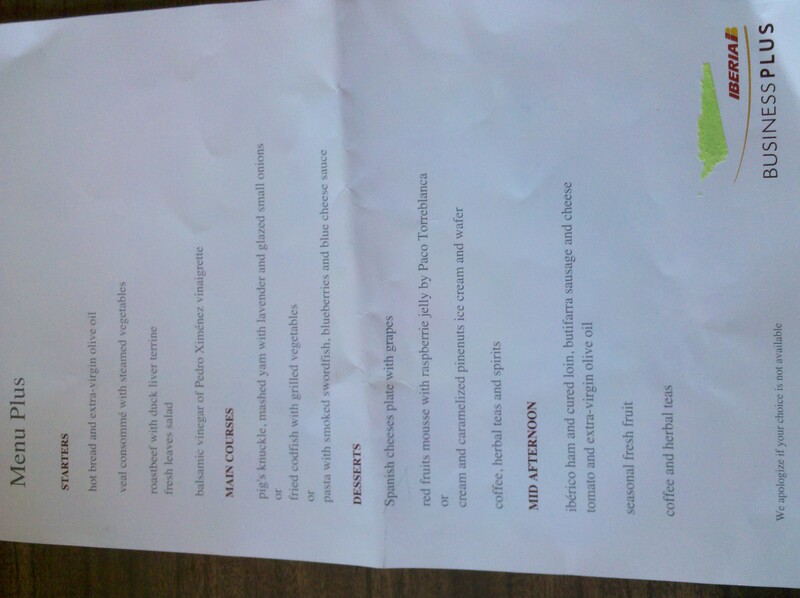 My new favorite menu was just given to me by my sister’s in-laws. They recently returned from Europe and flew Iberia. 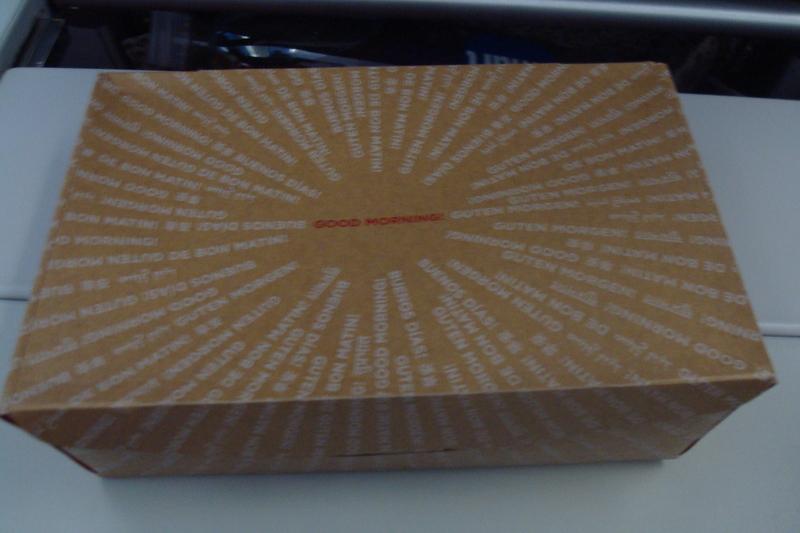 I was thrilled that they remembered that I’m really interested in airline meals and pocketed the menu for me! Now, let’s pretend I was on this flight. What would I select as my main course? I definitely would NOT go for the swordfish. a. It’s high in mercury. b. the blueberry and blue cheese sauce combination sounds pretty gross. So would my final choice be the fried codfish? I guess that is the “safest” bet but I’m curious what type of sauce it will come with because I’ve been told by airline caterers that fried food does not hold up well when reheated in the aircraft. I think I would have to go with the pig’s knuckle because at least there will be a sense of adventure without it being totally inedible. And if I don’t like it, I can always ask for more bread and maybe more starters!